I’ve been scouring Youtube, looking for the perfect Michael Flatley video. And happily, I found it. It’s his very first performance of Riverdance, long before he would become known as… the Lord of the Dance. His first performance of the piece was as an interval act for the 1994 Eurovision Song Contest. Well, he and his flowy blouse brought down the house, and the rest is Irish line dancing history. So I lift my glass to Michael Flatley, as I enjoy my Irish corned beef and cabbage feast. This meal came together really quickly now that I have an Instant Pot. Instead of braising the beef brisket for 3 hours, I pressure cooked it in the Instant Pot for 70 minutes. The cabbage went in for 3 minutes more, and then I was done. Easy. The meat was tender and delicious and the cabbage made for a great low carb side. Easy and delicious, my two favorite food adjectives. But now I must get back to the Lord of the Pleated Pants. Chow! This low carb corned beef and cabbage recipe make for the perfect dinner and comes together quickly in the Instant Pot. 1. Rinse and dry the corned beef and put it in the Instant Pot on the rack. 2. Add the water, garlic, ginger, onions and pickling spices to the Instant Pot and close the lid, making sure that the vent valve is closed. 3. Pressure cook the corned beef on HiGH for 70 minutes. If the roast is thicker an 1 1/2 inches, then add 6 minutes of cooking time for each 1/2 inch. 4. If the floating valve doesn’t drop after 15 minutes, release the remaining pressure by turning the venting knob from sealing position to venting position. Set aside cooked corned beef and 3 cups of the hot liquid in a large serving bowl. There should be about 1 1/2 – 2 cups of liquid left in the pressure cooker. 5. Cut the cabbage into 8 wedges, leaving the core in so that it holds together. (You can cut the core out before you serve it.) Add the cabbage to the pressure cooker and pressure cook on HIGH for 2-3 minutes, depending on the size of the cabbage. 6. Once the corned beef has cooled, cut against the grain into 1/8 inch slices. Serve with a cabbage wedge on the side. If you have any leftovers, you can make this Corned Beef Hash. 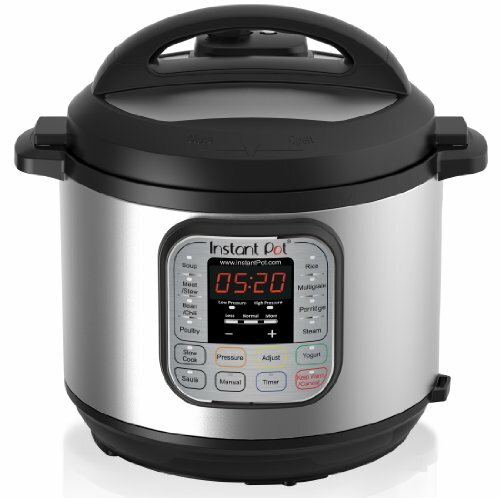 It never occurred to me to get a pressure cooker until I started hearing about Instant Pots, but now I am a convert. So easy to use. My family loved this recipe even my husband who didn’t want me to cook corned beef in the first place. He’s never cared for corned beef in the past because it always came out tough using the traditional stove top method. With the pressure cooker, all the toughness is gone. So glad the recipe passed the husband test! Thanks for letting me know. The Lord of the Dance! I haven’t thought about him in years. Boy howdy could he dance!